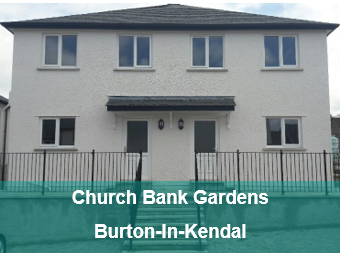 SLH are now advertising two new 3 bed houses for Shared Ownership in a development at Church Bank Gardens, Burton in Kendal. These form part of an ambitious development programme to deliver over 300 new affordable homes across the South Lakeland District in the next few years. Whilst there will inevitably need to be some market sale properties to help subsidise the cost of developing these new homes, the majority will be available at an affordable rent but we will also expand our range of affordable products to help local people. We know that the ratio of house prices to local incomes in South Lakeland is 10 to 1 so there is a clear need for more affordable homes. This is why SLH is offering alternative affordable rented products including Shared Ownership and Rent to Buy properties. These initiatives will target those people who would like to get a foot on the property ladder but can’t afford to buy outright. SLH have been working closely with South Lakeland District Council (SLDC), Homes England and our development partners to deliver these new homes. So far this year we have completed 14 in Kendal, purchased 4 in Burton in Kendal and 5 in Levens. We expect to complete purchases on another 7 early in the New Year. Planning applications have already been submitted for developments of 26 new homes in Kendal and 2 in Allithwaite. More planning applications are due to be submitted in early 2019 for another 45 new homes across the District. In addition to these, SLH are working with local developers to deliver over 40 new homes on new housing developments within Kendal. Our commitment to delivering these homes is part of our partnership with SLDC to assist their target of 1,000 new homes for rent by 2025. This is a key priority for SLH and will enable us to house families and those in need of a new home for many years to come.